The Balanced Audio Technology VK-3i offers an unmatched combination of performance and value in a fully balanced line stage. This six-tube, zero-feedback design features vacuum-tube current regulation, continuously adjustable shunt volume control, custom encapsulated oil-filled signal capacitors, and the same Unistage circuit topology used throughout the BAT series of line stage preamplifiers. 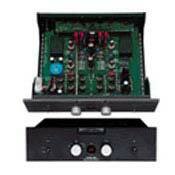 The VK-3i's Unistage design provides a single gain stage to amplify the signal. The stage-to-stage coupling distortions inherent in complex buffer or follower circuits are eliminated altogether. This single-stage design works together with the VK-3i's shunt volume control and custom encapsulated oil-filled signal capacitors to convey the pace, excitement, and nuance of a fine recording. LP card is a must if you love LP's. You can use this as a reference. One balanced input for a source which if not used for CD's can limit the number of sources you can use. Obtained this pre-amp after a long search. Got it, because compared to other products, it seemed to do very little to the signal yet was very musical.